Finally! All of a sudden I got an evening with ccb23 to hack of lives away. This time: NFC like it’s 2009. Aka violet mir:ror. Out of the blue we were brainstroming how to DYI hörbert, a smart mp3 player for our youngest. Here, a mp3 is selected via NFC sensor. O.T: “NFC sensor!? Wait, I remember having touch this years ago, lemme get the Nabaztag”. 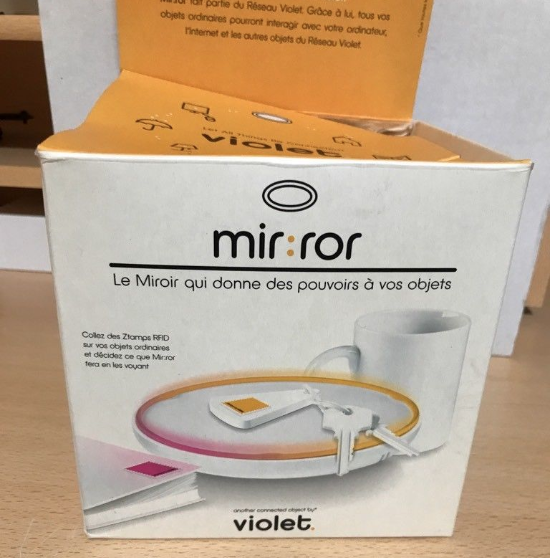 And indeed, along with the infamous Nabaztag IOT rabbit, violet released a side product called ‘mir:ror’ in 2009(?). It’s a NFC to USB device meant to showcase & utilize its capabilities. To bad official drivers were only released for WIN and discontinued with the bankrupt of violet. But opensource to rescue. We quick figure the device adheres to HID standard, so let’s get it working (on a mac/linux). After confirming the device is recognised in MacOS X we got hooked. Next, with a quick google search we first discovered http://reflektor.sourceforge.net – an OOO implementation based on hidraw. too bad kernel extension is Linux specific, so next the HIDapi, an OS agnostic lib for general purpose use, felt promising. Indeed, we got the mir:ror up and running the first time on Mac, although reading was non blocking and we couldn’t really make sense out of it. After various back and forth, we jumped back to start: let’s check on linux first. So with virtualbox and ubuntu we were able to install reflektor and use it via hidraw. Worked like a charm! So next is porting this to MacOSX and getting deeper understand of mirware. What commands are supported? Modifying (or just turning off) the choreo would be a huge plus towards using mir:ror for our custom mp3 project. In anycase, this 10 years old device was way ahead of its time and still works like wooow! TL;DR; Always check fuses first! 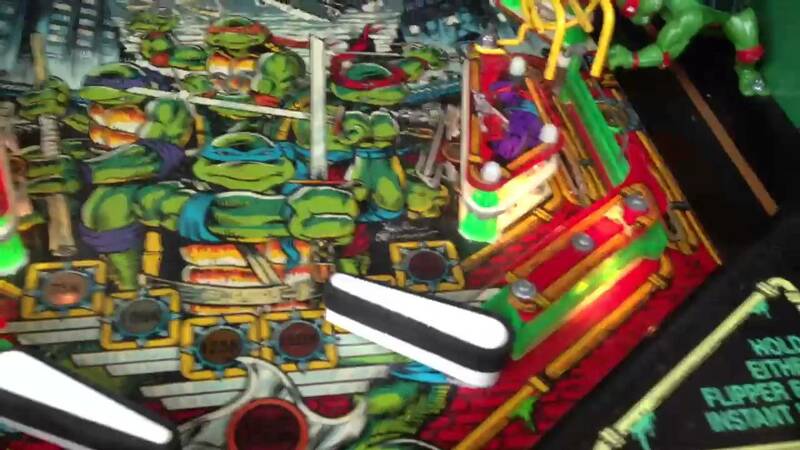 We love to play our Data East TMNT Pinball, but unfortunately the ball got lost more and more often, due to weak flippers. The flippers did hold up, but one could easily push the down, and so did the ball. What’s the problem a big mystery! First, we thought it’s something mechanical and did rebuild the flippers – both side. For that we used the DA Flipper Rebuild kid from Pinball Center(?). The flippers got more precise, but kept on being weak. It had to be something electronic. So we started to learn about Solid State Flippers, were the control unit is located and Diodes. We followed this great guide from Flipperwinkel, a lots of insights, but couldn’t spot any problem. So we started measuring volts and current. It turned out that one of the fuses was broken. Important part about this is, that the flipper controller has four fuses. One for each flipper to activate, and two to hold any flipper. Which means, even when one hold fuse is broken, the other still holds up. But only half the current, so the flippers results in being weak. We replaced the broken fuse, and the flipper work as strong as never before… check! Nice sum up on our HackTheHouse 2nd price. Let’s talk about credentials. Credentials! Who doesn’t work without any secret data which should never go public? Sure, sure, we’d never share those secrets public, but then there’s git, and github and.. BAAMM.. credentials exposed. Upps! To avoid this, it’s common sense to NOT checkin any credentials. NEVER. EVER. We make use of .gitignore, cfg templates and placeholders. But nevertheless it’s a hassle, especially when working in a team, where a credential exchange is sometimes required. In past, I preferred the solution where an encryption server in a save environment took care about encrypting/decrypting data. Once the data is encrypted, it’s save to checkin, store and share in the same way like any other data. Only users (or systems) with access rights for the encryption server can decrypt the data. Instant WIN! But how to setup such a server? See the vault config docs for other options. Execute this three times, and enter a different key each time. DONE! Now the server is up and running and you can connect from you local machine to the vault. Enter the root token-key obtained from step 1. Later, I’d strongly recommend to use a non-root token. In order to allow other people access to the vault and decrypt data, it’s the easiest to enable github authentication. In this case, every user part to a specific github team is able to obtain an auth-token themselves. Whereas <github token> only requires the ‘read:org’ scope to be granted. Once auth is complete the actual vault token will be stored in ~/.vault-token and allows the user to connect to the vault. DONE! Now the encryption server is ready to encrypt. For this I used json as response format and jq to extract the data. # encrypt file. will overwrite existing ones! # decrypt file. will overwrite existing ones! # decrypt file and open for edit. on close encrypt changes. – intuitive connected toys for less screentime and more play. – a Lego ‘extension’ for smart senors and actor modules. Super simple to control and programm. For Kids starting from 6years! How I revived my iPod classic 4th genation with Flash Memory!! Comments Off on How I revived my iPod classic 4th genation with Flash Memory!! Since a very long time, I had my old 4th Generation iPod laying around. With iPhone, SoundCloud & Co, I hadn’t had any use for it – until now: my Camping Van came ‘only’ with a CD Radio and an Aux-In – which is perfect for my Ipod. If it would only work. Battery was down, and even worse – the Harddisk crashed. But a quick google made me hope: there’s indeed a chance to replace the HD with Flash memory. Faster, cheeper and less power consumption. I had to try it. Main trick is to get a ‘IDE 50 Pin Male zu CF Compact Flash Female Adapter’ – on ebay or similar for just 5 EURs. Compact Flash memory you get for abt. 1EUR per GB, which int total, made the 40GB replacement quite cheap. It just took me minutes to replace the harddrive, including a new Battery. Now my more than 10 years(!!) old iPod works better like never before! Amazing.